As a guest student here for a year to research, I always knew there would be a time when I'd have to return home to Chicago. When the Danish authorities could legally "use force, if necessary" to kick me outside the country's borders (challenge: accepted). A year learning about Danish urban planning and bicycle infrastructure felt like a tremendous amount of hours in the beginning, but like any journey, the ending feels surreal and much to soon. There are some things I immediately know I will miss about living here. The near instant accessibility to scores of bakeries selling the kanelsnegle, for instance. An illogically delicious, simultaneously gooey and flaky, flat cinnamon bun. Other details are more fleeting: memories of conversations with Danes and other international. The color of light on the pavement after cycling home late at night. Our work throughout this blog is dedicated to exposing these fine details to an international audience. Hence, the impossibility to squeeze these thousands of details into one small list. But here is a sampling, in no particular order, of the top ten conversations I've had regarding biking in Copenhagen. And one more thing: forgive me if the following list gets more sappy than Danny Kaye's sailor mates after a few swigs of Gammel Dansk. 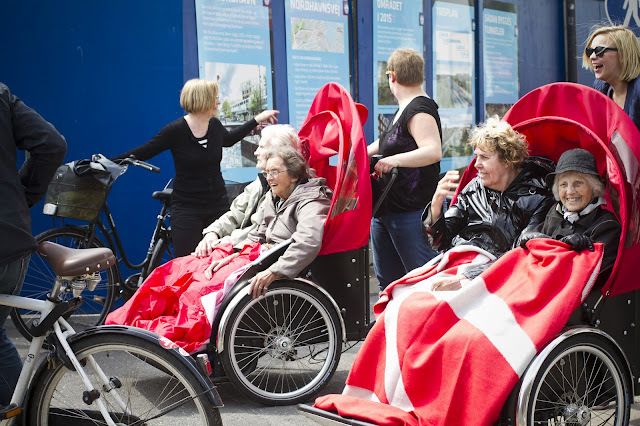 1) "But of course they must have cargo bikes in Iceland!" My friend said this in disbelief as I told her about Copenahgenize Design Co.'s quest to find the most northerly cargo bike. The fact that it seemed so odd to her that a place would not have cargo bikes was completely amazing to me. 2) "Can I please just go through this red light?!" 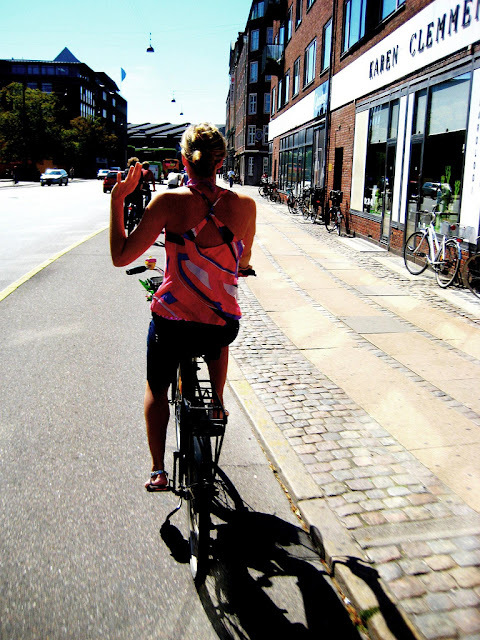 3) "Mittens...because you can't bike without gloves in Copenhagen"
Master's student from France here for her studies. She was asked to describe riding a bicycle in Copenhagen in three words. She gave "mittens" as her third word. We spoke with her in February, but her words rang true until April and were often quoted amongst colleagues. 4) "You can turn like that? I never even thought of that!" A friend's amazement that in Chicago, we all (or nearly all, most accurately) turn "like cars" in the left hand turn lane instead of pulling through an intersection, stopping at the light after turning 90 degrees, and continuing on segregated cycle track. Turning left in Chicago is something that many a new bicycle user fears. Here, it becomes second nature. 5) "Yes, one can learn many things"
New bicycle rider at a Red Cross bicycle training course. The organisation teaches adults who have moved here from other countries and never learned to cycle as children. I was lucky enough to meet some of these people by becoming a volunteer bicycle teacher. One of the participants, a quite gifted older woman said this in Danish while gracefully sailing past me. It was one of those moments that just gives you an all-around good feeling because of the stark truth in what she was saying. Here was someone who initially was hesitant to try this thing that so many of her peers were using since childhood. But look at her now. Confident not only in biking, but in the ability of herself and people in general. 6) "I'm buying a bike when I get home!" Australian university student's exclamation while talking about biking in Copenhagen. Before this he was saying how hardly anyone uses bicycles in his hometown. With renewed vigor, he'll go home and teach them a thing or two. And luckily, Velo City 2014 takes place in his university's backyard: Adelaide. 7) "But do you ever feel limited by transport there?" My boyfriend in Chicago, talking to me on Skype. I could honestly answer that in my day-to-day experience, no. I feel fully able to go wherever I please in total security. At 4:00 or at 16:00. Through rain, sleet, snow, or hail. Okay, maybe I've never seen hail while living here. 8) "But what's your guys' bike culture like in Chicago?" One of the first things my friend and classmate asked me when I told him where I was from. I remember us standing on the platform at Trekroner Station near Roskilde University, during a university organisation-led trip to Roskilde (a town a little more than 34km outside of Copenhagen). He had his bike in hand and the conversation had started to drift to topics other than biking before he interjected with this question. It felt like the most fitting thing in the world to stand in Denmark exchanging notes on bicycle mainstreaming before I had even passed the one-week mark of my stay. The picture above shows part of an obstacle course arranged by the Danish Cyclists' Federation so that "mini Copenhageners" can practice their bicycle skills. The sound of a gleeful little kid in the front of a cargo bike. All the ones I've seen are adorable. Downy, frequently blonde tiny heads poke out of cargo bike boxes. The particular case I'm thinking of was a little girl in snazzy pink sunglasses. Her arm stuck straight out in front of her. Soaring north through the neighborhood/island called Amager. Completing her completely jovial and free-wheeling image was what she held in front of her. She grasped a biscuit in her outstretched hand as if she wanted it too, to feel the freedom of flying. So #9 and #10 are cheating, since they are just sounds. #10 cheats even more, since it depicts silence. But regardless. Imagine a caravan of bicycle rickshaws lumbering through the ordinarily quickly-paced cycle track. The drivers are young but the occupants are quite advanced in age. They are elderly folk from a local nursing home that was hooked up with a sweet rickshaw initiative called 'Cykler Uden Alder-- Cycling Without Age'. As part of an event called '100 In One Day', we rode our bikes alongside the rickshaws up the coast of Zealand to a town just north of Copenhagen, called Gentofte. The look on the first passerby's face showed pure wonder. The couple in the rickshaw were suddenly transformed into mightier figures than Queen Margrethe and Henrik, Prince Consort. The passerby simply enjoyed seeing two other people enjoying time in the fresh air. Copenhagen, you might not notice that I've gone away from your ports and away from my spot at the Black Diamond Library, but I won't stop talking about what my country (and many others) can learn about how to create bicycle friendly cities focused on the people. So just as I step unto the jet plane I'll run through this list one last time. But not until I check to make sure the smuggled kanelsnegle is hidden from the Beagle Brigade dogs' hungry noses.